A brother and sister have been jailed for life for murdering her wealthy lover and then burning his body. 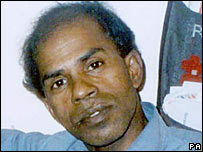 Shah Afruj Ali, 40, a father-of-three and builder, was stabbed and his body burnt in Epping Forest, Essex, in 2005. Joygun Nessa killed Mr Ali after he became besotted with her and refused to end their affair, the Old Bailey heard. Nessa, 27, of Bow, east London, will serve a minimum of 13 years. 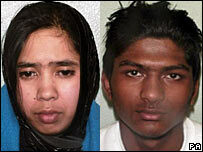 Her brother Azhor Khan, 18, was told he would serve a minimum of 11 years. Khan, 18, of Stepney, east London, was found guilty of murder with Nessa in August. Nessa "lured" Mr Ali to Epping Forest where he was attacked with a dagger. On the way to the woodland, she bought petrol, which was later used to burn the victim's body, the court heard. Nessa and Khan then drove off in Mr Ali's car, with other unidentified men, and later set it alight. Mr Ali was last seen alive by his wife on 12 February. His badly charred body was discovered three days later and dental records had to be used to identify him, the court heard. The builder had been having a seven-year affair with divorcee and mother-of-one Nessa, which continued even after she began to see another man. Mr Ali had told a friend his relationship with Nessa was "pure infatuation" and he had spent £27,000 on her. Judge Jeremy Roberts said the victim, who was "besotted" with Nessa, was killed within a week of her new partner discovering their affair. Khan's friend, Rayhan Raza, 19, of Hackney, east London, was found guilty of conspiracy to cause bodily harm in August.